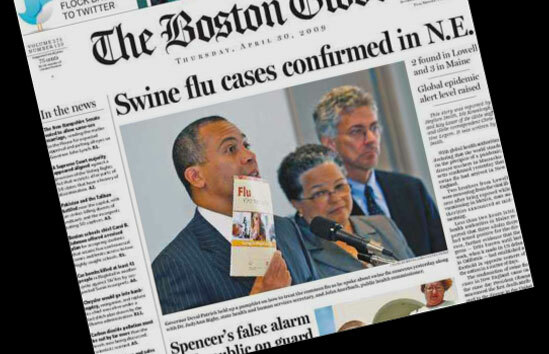 Massachusetts Governor Deval Patrick holds the Flu booklet aloft during a press conference called to address public concerns about H1N1 virus (Swine Flu) during an outbreak in the spring of 2009. Department of Public Health commissioner, John Auerbach and Human Services secretary, Judy Bigby look on. Since the booklet discusses treatment for seasonal as well as pandemic flu, it provided timely information.